I once entered into a humorous discussion with an American about English slang. And by that I mean slang used by British people for he really didn’t consider it correct to call such slang ‘English’. He was American after all, and from cowboy country – Texas to be exact, with a cowboy hat to show for it. Newly arrived in London, everything was quite astoundingly strange to him. For those of you who have ever had the experience of being an expatriate, the feelings of perplexity around the unfamiliarity of a new country might resound. But perhaps the most perplexing thing for him was the ‘language’. “Bob’s your uncle?? Now what is that suppose to mean?” he would say. Hmm, I take his point. I too am an expatriate in London, but I do know what ‘Bob’s your uncle’ means. Jamie Oliver has used it often enough on his cooking shows, but I don’t know why it means what it does. But then, I’m hardly one to ask. Not having grown up in Britain, I’ve not been exposed to certain ‘English’ slang. Take for instance the idiom ‘pig’s ear’. Goodness knows I had no idea what an ear of a pig meant until it was revealed to me at an eating expedition to the gastropub, The Pig’s Ear, as rhyming slang for beer. The Pig’s Ear had come to my attention on account of a similarly piggy friend of mine murmuring into my little piggy ear something about having recently dined there and thoroughly enjoying it. Browsing through Peter Prescott and Sir Terence Conran’s book, Eat London, I also happened to stumble across the write-up for The Pig’s Ear. They rate it as one of the best gastropubs in London. This meant only good things, which was why my friends, S and T, and I went in search of a little piggy adventure. Clearly a local favourite, the pub section of The Pig’s Ear, which also offers a reasonably priced bar menu, was packed when we arrived. But then, the place is rather small, and with not much standing space we had to weave our way through many bodies to reach a steep flight of stairs that took us to the gastro bit of the establishment. Upstairs it was much less crowded and far more sedate. I liked the place. It’s all kind of wooden and brown, with the odd picture here and there. There are also a few mirrors hanging about, probably more to keep the walls from lying bare than perhaps for any aesthetic advantages. However they did serve to prop up the Christmas lights which were out in force. With the added touches of candles and lilies, the room is simply furnished, but rustic and inviting at the same time; the kind of local you’d want to find around the corner from home so that you could easily stumble back after a long night out on the ‘pig’s ear’. The menu is one of those daily changing ones, and so creativity and seasonality is therefore on the cards. With about half a dozen starter choices, I was torn between sampling a cooked starter and my desire for some good Irish rock oysters (six for £8.95). But as S ended up ordering half a dozen of the little babies himself I decided to hedge my bets. As it turned out, I hedged correctly, managing to have both my choice of a snail and chorizo fricassee (£6.95) and sneakily one of S’s oysters to boot. The oyster was fresh and juicy. The fricassee was creamy, and the sauce tasty and technically deftly executed. However, being more orangey brown in colour than white, my only slight quibble was that it was also a little sweet, which had the effect of drowning out the pungent smoky flavour of the chorizo, rather than letting it shine through. T’s salad of smoked pigeon (£6.95) was the most perfectly seasoned of salads with gamey and succulent slices of gently smoked pigeon. The crispy greens were dressed lightly and delicately with a skilfully balanced mix of olive oil, garlic and mustard. There was also an added touch of honey, just enough to tantalise the palate. T’s main of Irish sirloin steak (£15.95) was classy. The meat tender and rendered pink throughout, it came with a mellow blue cheese sauce which served to add a nice contrast to the meat but was not so powerful as to overwhelm the sirloin. S’s main of pork belly braised in honey, soy and ginger (£15.95) was also nicely executed. But it was my main of roasted partridge with white truffle broth (£15.75) that wowed. 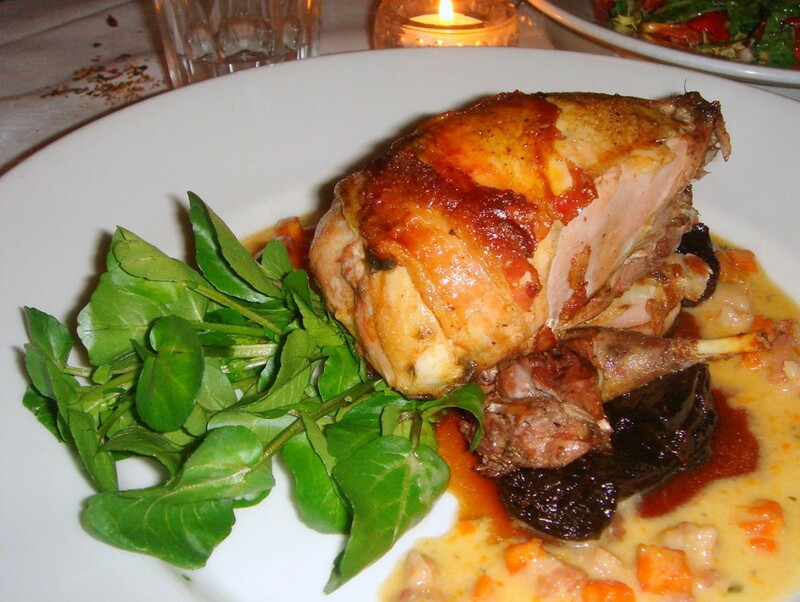 The partridge, roasted to perfection, was gamey, tender and succulent. The broth, more of a beautifully and intensely reduced sauce, was wonderfully warm for both the truffle and the chestnut flavours bursting through. A perfect autumnal, seasonal dish – my only complaint was that there was not more sauce. Puddings were tasty and satisfying with a mirabelle plum and blackberry crumble ice-cream (£5.50) proving lusciously creamy. 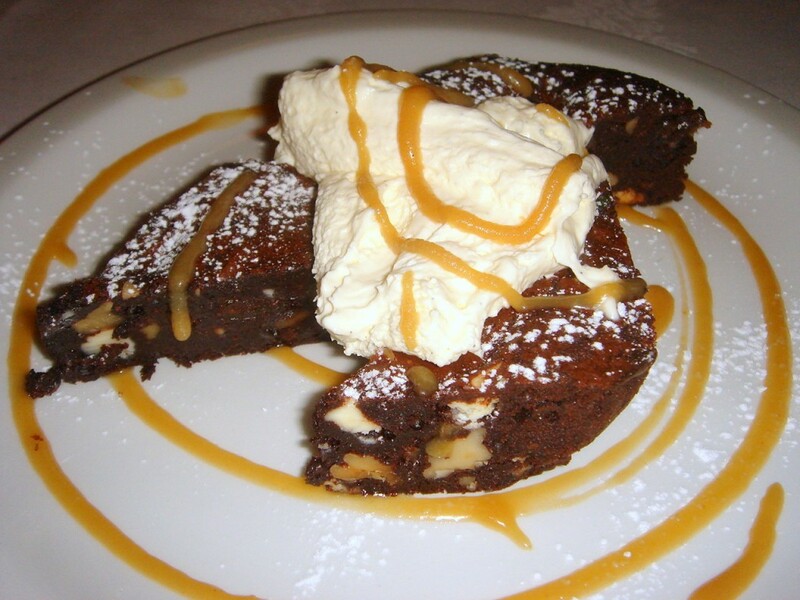 A Medjool date, walnut and chocolate brownie with toffee sauce (£5.50) was rich and decadent, like little mouthfuls of chocolate and walnut-y crunch and date-y sweetness with a subtle creamy contrast coming from the vanilla crème fraiche. Service was delightful and unimposing. I constantly spotted the waiters peering over from an unimposing distance to check on our progress. The cooking abounded in sound technique throughout. 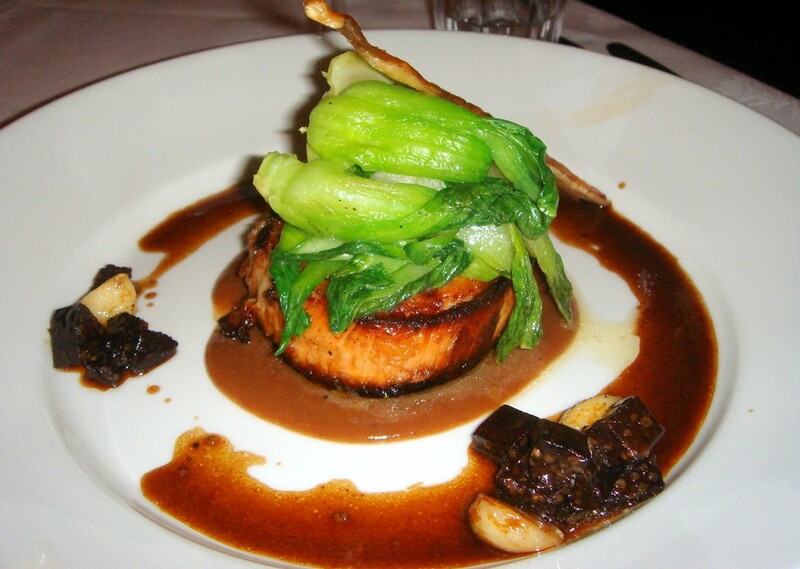 There was true depth of flavour and innovation in the design of the dishes. Astoundingly good with both the food and the wine (starting at £15 a bottle) being reasonably priced, I would say give me rhyming slang any day. 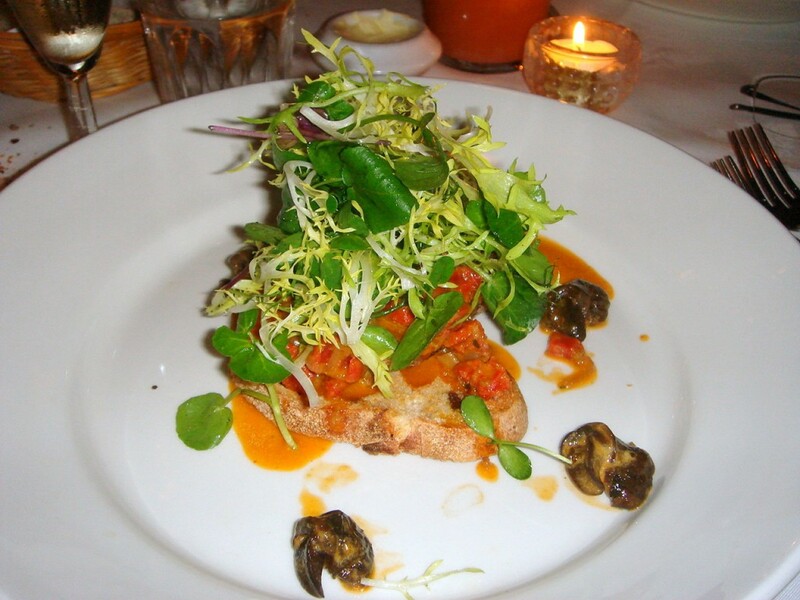 Approximate price bracket – £25 to £35 (based on three courses). Excludes drinks and service.